Plants that will grow well in shady gardens or courtyards are of great value to gardeners and landscapers alike. The type of shade will determine the best plants for the garden. Partial, or semi shade is a little easier to grow plants in than deep shade, although a number of ground cover plants are suited to deep shade, even in the UK. Some of the best plants for shade are ferns, epimediums, clivia, they all love low light, however plants such as Aucuba Japonica, Camellias, Hellebores, Cyclamen and Tellima can also be considered. Any top ten plant list is a little debatable. We have selected plants that grow well in shade, are easy care, add a little colour, and provide different characteristics. Hostas, Lily of the Valley, Astilbe, and Cyclamen are next on the shopping list. In inner city areas shade from neighbouring buildings is always an issue however if you are looking for plants to grow in shade, semi shade, in the ground or in pots or containers a solution can be found. Shade is a relative term, Full Shade, Part Shade, Afternoon Shade and Dappled Shade, all have different requirements. It is essential when looking for suitable shade plants to first determine the type of shade and amount of shade that you will be dealing with. Filtered shade from trees is a different issue to full shade from buildings. Part shade and full shade are very different growing conditions so observe the area closely before choosing plants. Full shade does not mean no light at all, it refers to areas that receive little or no real direct light, usually these areas are suited to ferns, clivias, epimediums and hostas. Hellebores and a few others will grow in these areas, however the degree of light may well affect flowering. Dappled shade is the type of shade that we tend to get beneath deciduous trees, these areas are similar to many native woodlands, so here we start to look for woodland plants. Afternoon shade is great for those plants that love some light but do not cope well with hot afternoon sun, think hydrangeas. And of course we have areas that are shaded by coniferous trees, these are the areas that create real problems, more because of the leaves that (pine needles) that make it difficult to grow much at all, and for some spots there is really no solution. For the rest we have a list of plants for shady positions in the garden. Shady spot needs some shade tolerant plants, some gardens are almost entirely in shade for a large part of the day. Shade can be because of buildings, trees or terrain and shaded areas may be dry or wet. When selecting garden plants for shade first determine the amount of shade and soil conditions (wet or dry). Shade area beneath trees is often dry so consider this when looking for shade plants. Dry shade and moist shade also present different growing conditions, again be observant before talking to your nurseryman. Plants for dry shade are great for planting beneath large trees in the garden. Plants that will grow in the dry shady areas next to buildings are also much in demand. One of our best shade plants, they cope with dry conditions, are great ground cover plants and have interesting flowers as well. 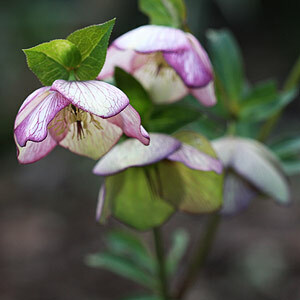 Well known for the ability to thrive in dry shade hellebores also provide some great flowers in the colder months. Plants for wet or damp shaded areas are required for shaded positions near waterways or other damp areas. Try corydalis elata in a damp shaded position, the lovely blue flowers are a real highlight and it copes with dry conditions as well. These are the versatile ones such as Aucuba japonica, Fuchsias, Pieris japonica, Rhododendrons, Camellias an Viburnums. In gerneral these plants prefer afternoon shade. They add color and life to many parts of the garden. Brunnera macrophylla is one plant that copes in dry or damp shade. So in summary, choose your position, determine the soil conditions and moisture, look at your requirements in terms of flowers and maintenance and you are ready to choose those wonderful shade loving plants. Shade plants are a most useful addition to many gardens. Plants will successfully grow in shaded areas of the garden under trees or in pots and containers range from ferns through to plants that will flower in shade such as clivia, many plants do well with a little shade, the ones that cope with deep shade can provide a lift to areas where nothing seems to grow.